Police are still hunting a masked gang who carried out a series of rush hour car-jackings in Leeds after robbing a jewellers in Harrogate. Detectives have released further details about the crime spree carried out by the armed men on Thursday morning and appealed again for witnesses to come forward. The gang smashed their way into A Fattorini The Jeweller on Parliament Street in Harrogate at about 8.35am. After initially suggesting they left empty-handed, North Yorkshire Police has now confirmed the men got away with some items of jewellery – but said they are still trying to determine the value of the haul. The men escaped in a grey Vauxhall Vivaro van, which they then abandoned on Valley Road in Harrogate, where they got into a waiting orange Ford Focus. 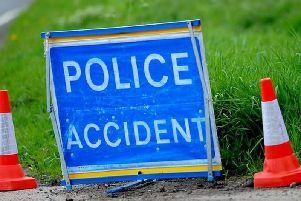 That car was ditched when it sustained a burst tyre on Kirkstall Road in Leeds at about 9am. The gang tried to car-jack a BMW, before stealing a van and a Vauxhall Corsa from drivers who were stuck in traffic. Detective Inspector Nichola Holden, of Harrogate CID, said: “I would like to thank the people who have already come forward with information but we are still seeking witnesses who can help us identify who was involved in this robbery. Anyone with information should call North Yorkshire Police via 101 or Crimestoppers, anonymously, on 0800 555111.